Jennifer graduated from LABAN with a BA Hons in Dance Theatre. Since then she has been working in Theatre, Opera, Comedy, Dance and Film as Choreographer and Movement director. Her work has been presented in Germany, Sweden, Italy, Spain, Portugal, USA, Scotland, Wales and England. Alongside this Jennifer co-founded and continues to direct theatre companies; 'The Mostly Everything People' and 'NOVA'. Jennifer grew up in Cornwall before training in Dance Theatre at LABAN. Since then she has worked in many areas of performance as a choreographer, director, movement director, performer and continues to make work with the two companies she has co-founded; The Mostly Everything People and NOVA. She is currently developing a new musical as part of the Andrew Lloyd Webber Funded Bridge Project at Brit School with Harry Blake. See below for details on work to date with the above companies and other credits/collaborations. Two productions for Grosvenor Park Open Air Theatre's 2018 summer season directed by Alex Clifton and Bill Buckhurst. Co-directed by Marcus Romer and Bin Tinniswood this site-specific National Theatre Wales production took place on the Outpatients ward at Royal Gwent Hospital. 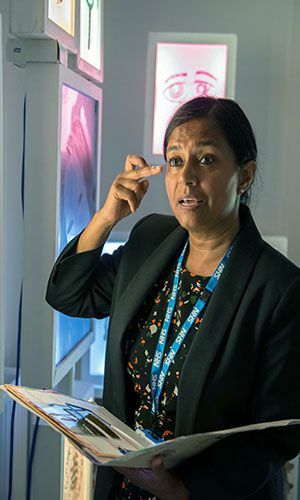 Programmed as part of the NHS:70 festival to celebrate 70 years of the NHS. An original musical by Harry Blake, produced by Vicky Graham Productions and HighTide. Venues include North Wall (Oxford), Assembly Festival (Edinburgh), Adleburgh, Harlow Playhouse and The Lowry Studio (Manchester). "...with charming choreography from Jennifer Fletcher" - the i paper. "...refreshing to see a new British musical this original" - The Scotsman. "...Jennifer Fletcher's choreography and Harrison White's musical direction are slick.." - The Stage. A brand new work through NOVA inspired by a WEF report that claims we won't reach gender equality until the year 2133. This production (premiering 2019 in Wales) will be created around a model that can be adapted to integrate spoken and sign language of the region it is performed in. Supported by Arts Council England, Arts Council Wales, Wales Arts International, Teatromosca, Chapter Arts Centre, AMATA, Artists International Development Fund (British council), Kinderenvandevilla and Riverfront Arts Centre. A new musical in development with House of Blakewell first presented at Vault Festival, supported by Arts Council England. A world premiere of Enid Blyton's classic staged at Storyhouse over Christmas 2017. This new production by Storyhouse, directed by Alex Clifton, Written by Glyn Maxwell and Music by Harry Blake opened the their brand new £37million building in Chester in May 2017. Co-production - Mid Wales Opera/Royal Welsh College of Music and Drama. Directed by Martin Constantine. Development and tour in Wales. "...an invigorating - sometimes quirkily comic - cautionary tale for the social media age." - The Independent. "....singing with a suitable balance of attack and delicacy and moving around the stage nimbly. Credit goes to Associate director/movement Jennifer Fletcher for her work in facilitating this" - Wales Art Review. "...it is hard to think of a recent production so jam-packed with clever modern twists and illusions.." - Arts Scene in Wales. The Mostly Everything People. Development and tour supported by Arts Council England, AMATA (Falmouth University and Nescot College). Unicorn Theatre; directed and created by Thomas Eccleshare and Valentina Cescchi. NOVA: Development and ongoing tour dates. Invisible City was initially developed into a full production in early 2015 and has since toured to London, Cardiff, Cornwall, Edinburgh, Devon, Lisbon, Bilbao, Santander, Barcelona, Venice receiving multiple 5 star reviews. Supported by Arts Council England, Arts Council Wales, Wales Arts International and Chapter Arts Centre. The Deaf and Hearing Ensemble; directed by Jennifer Bates. Featured on BBC 2's 'See Hear'. 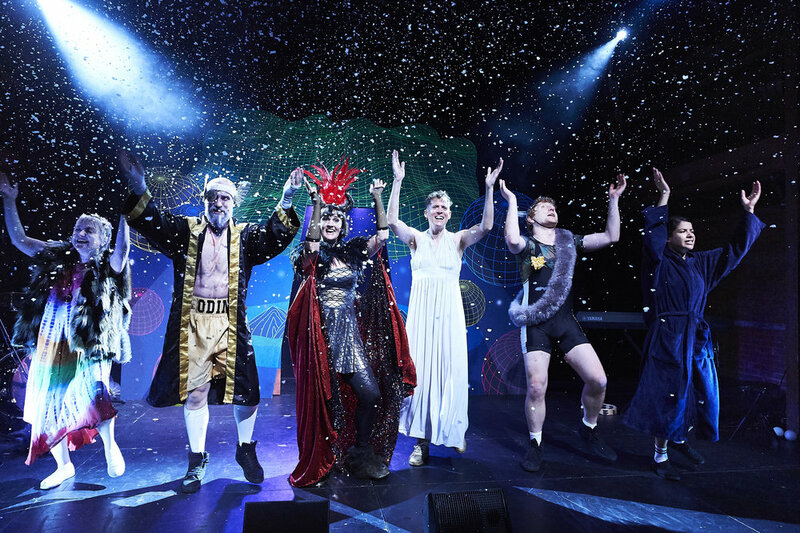 Supported by Arts Council England performances include: Pulse Festival (Ipswich), NOW 16 at The Yard Theatre (London), The Roundhouse (London), Southwark Playhouse (London), Summerhall (Edinburgh, curated by Northern Stage). Brave New Worlds (Performed and created by Valentina Cescchi, Kate Lane and Guoda Jaruseviciute). Supported by Arts Council England, Barbican OpenLab, Lithuania Council for Culture and Middlesex University. The Band (led by director Tom Hughes and designer Cecile Tremolieres). Supported by Arts Council England and Theatre Delicatessen, Ajax will undergo further development before a run at Camden People's Theatre in late 2016. This brand new children's show by award-winning theatre company Dancing Brick, performed a successful run at the Unicorn Theatre in December 2016. The show was also supported by Sheffield Theatre where it will perform another run of dates in December 2017. "Nothing like I have ever seen before....something this good deserves to be shared" - Split the City. In 2015 Jennifer worked with PAD productions (Positive about deafness) twice in Derby on the creation of ‘Soul Bear’, a production that aims to be accessible to deaf and visually-impaired young audiences. Supported by ACE, Derby Theatre and Graeae Theatre the show will be undergo final development in summer 2016 before a national tour. Screened as a curtain raiser for main house performances at The Acorn (Penzance) and The Poly (Falmouth), and selected for EnCORE dance film festival in May 2016. Jennifer has worked with musical comedy duo House of Blakewell (Craig Barbour award for song writing - Soho Theatre) on their last 3 productions; Book of Blakewell, House Party and We Can Make You Happy. **** “Clever, funny and ultimately touching’ - The Scotsman. ***** The New Current "...an entertaining social satire with excellent and versatile musical performances" A Younger Theatre "House of Blakewell are impressive, operatic, razor-sharp" Broadway World. In 2014, Jennifer worked with OperaUpClose on their 6-week run of "Dido and Aeneas" at The Kings Head Theatre. OperaUpClose are well known for staging classic Opera's in modern settings and Jennifer was delighted to work with award-winning director Valentina Ceschi on this project. **** The Guardian, "A bold, beautiful and inclusive evening." Broadway World, "Great fun and beautifully sung" Time Out. "heart-rending" The Guardian, "the stylised choreography of the chorus, moonlighting from The Royal College of Music, was neatly managed" Venue. In 2012 Jennifer worked with LIVEARTSHOW on their multi-medium version of Wagner's "Rhinegold". Directed by Martin Constanitine, composed by Harry Blake and written by Alan Harris this production ran for 3 weeks at The Yard Theatre, Hackney. "impressive dance sequence" Wales Art Review, "moments of brilliance" Time Out, "The use of movement was also outstanding" Thefantailfoundation. In 2011 Jennifer worked with Aya Theatre on their production of "Kaspar" by Peter Handke for a 3 week run at a pop-up theatre in the railway arches/office space in Southwark. She collaborated with the company by acting as Movement director and brought on a team of dancers that she also performed alongside. "staged with skill and imagination" Time Out ****, "refreshingly abrasive" The Times.